This cache is along the North Fork Mountain Trail, which has been considered the most scenic trail in West Virginia by OUTSIDE magazine and others. If this trail is the best for scenery in the state (I think it is), then Chimney Top would be the golden crown upon this king of trails. 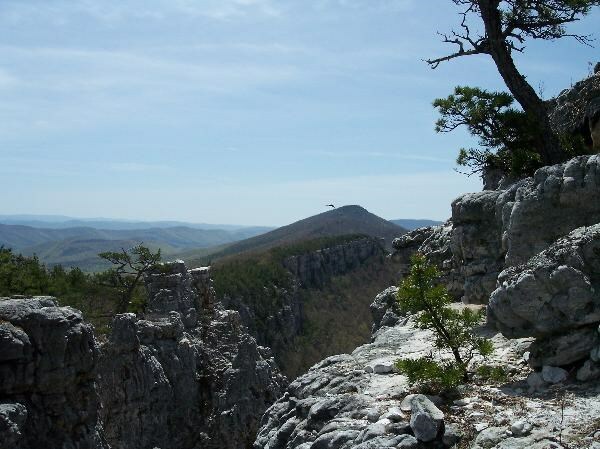 Chimney Top offers a 360* view of the surrounding mountains that is only rivaled by a few other WV locations, such as the Spruce Knob observation tower. The cache requires approximately 3 miles of uphill hiking if you access it from the northern end of the aforementioned trail. Allow a minimum of four hours for hiking and photography if you are in decent physical shape. A half-mile of the hike borders the edge of a spectacular cliff. Not only is this area thick with turkey vultures, there are peregrine falcons, various hawks and the occasional American Bald Eagle. The trail takes you through various distinct ecological zones consisting of mostly oak and other hardwoods, culminating in scrubby conifers. Besides a myriad of bird species, deer, chipmunks and occasionally bears and wild goats can be encountered. Also beware of the Timber Rattlers that inhabit these mountains. 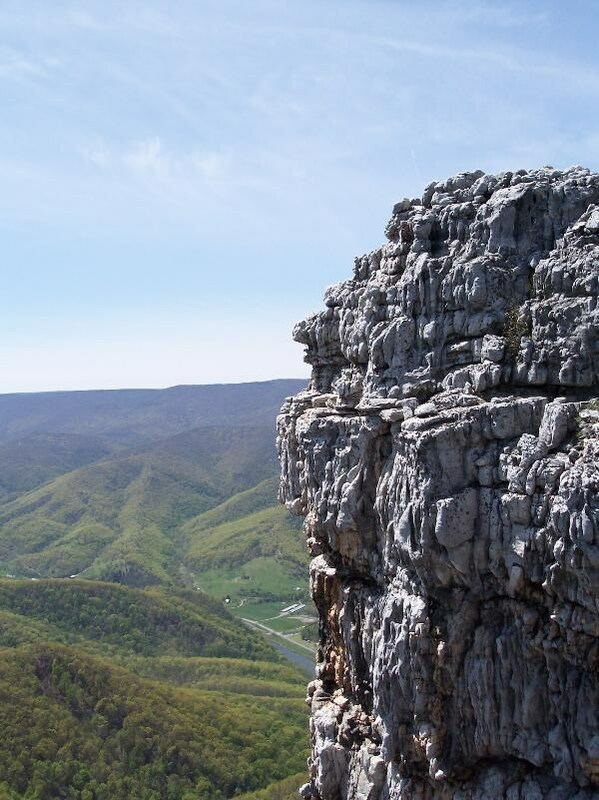 To access the cache, from Petersburg, WV, travel south toward Seneca Rocks on Route 28 (it is also Rt 55) pass through the small village of Cabins and then turn left on the bridge that crosses the North Fork of the South Branch of the Potomac River (CR28/11). This road goes to Smoke Hole and accesses Big Bend Recreational Area. You need only travel ¼ mile or so to the Trail Head parking lot at N 38* 58.889 W 079* 13.869. The parking lot is very small. Park here and begin your ascent on the trail. It will make many switchbacks before arriving at the cliffs N 38* 58.747 W 079* 14.904. Then continue on up the trail until you reach the small rock cairn at N 38* 58.339 W 079* 15.231. Turn right and follow the steep and faint trail up the hill to the cache. The coordinates should put you at the edge of a gap between giant rock formations. The cache is right ahead and below you, beyond the tall dead tree (depending on how long this tree stands). To your immediate right is an easier way to climb down to the cache. 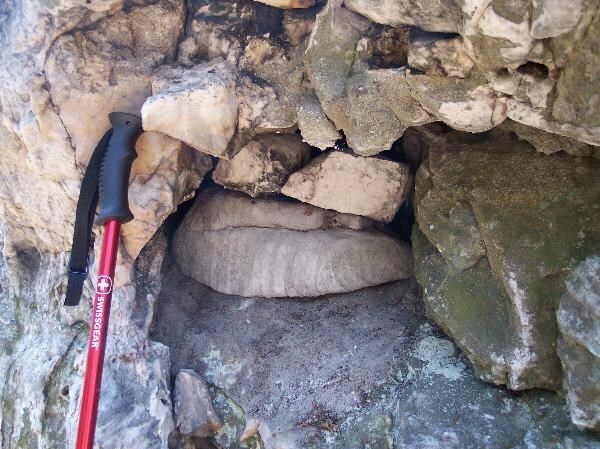 The cache is in a small cavity in the face of the cliff wall, hidden behind several small stones. Please put the stones back as you found them. Believe it or not, this remote area is visited frequently. Be sure to view the photos, as they will help you locate the cache. The cache is a Coleman one liter drinking bottle. It has a narrow opening and placing anything wider than a silver dollar in size is discouraged. Since this cache was impromptu in its placing, nothing was put in the cache except a whittled down log book and two pens. Only record your geo name and the date of find to save space in the log book. If you are hiking the entire trail, there are several other caches, including one of mine. Have fun! A Few We'll NEVER Forget! !